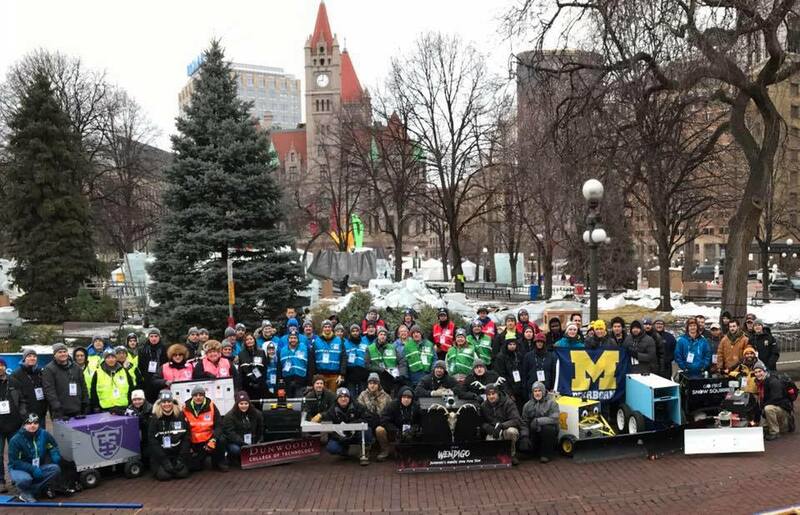 Dunwoody College of Technology recently competed in the Institute of Navigation (ION)’s Autonomous Snowplow Competition held during the St. Paul Winter Carnival in Rice Park January 26-29. 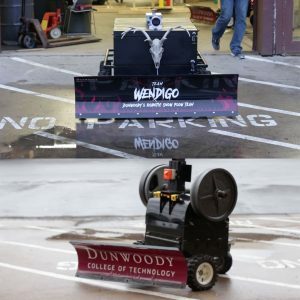 The College entered two robotic snowplows–the Snow Devil and the Wendigo. The Snow Devils earned fifth place and a $700 prize, while Team Wendigo placed third, earning a $2000 prize and the Bronze Snow Globe Award. The College, as a whole, also brought home a $500 prize for the Dr. Nattu Natarajan Golden Smile Award for best sportsmanship. The Award is named after University of Michigan-Dearborn professor Dr. Narasimhamurthi Natarajan (often called “Nattu”) who was known for his quick, insightful analysis followed by a joke and a smile. Nattu passed away from a lung illness on the Saturday morning of the 2016 competition while his two teams were competing. ION renamed its team sportsmanship award in honor of his leadership. This year, thirteen teams from the top engineering universities in the Upper Midwest participated. Dunwoody is one of just two schools that have been competing in the annual event since it first began in 2011. The College has since taken home several awards, including a third place prize in 2016. This year, Dunwoody decided to try something new by adding a second robot to its snowplow roster. The Snow Devil was built to compete in the first year of the competition. Since then, students have refined and added to this original design. The robot functions by following magnetic strips that can be installed on any sidewalk or driveway. The new Wendigo machine was created to complement the Snow Devil. The Wendigo uses a combination of a machine vision system and an inertial measurement unit to navigate up and down sidewalks and driveways. The teams presented their designs to a panel of judges on Thursday evening at the Minnesota Science Museum. After safety checks on Friday night, the teams competed on the sidewalk-clearing course on Saturday and then took on the driveway course on Sunday. Learn more about Dunwoody’s School of Engineering and Robotics & Manufacturing Department. ← Previous Previous post: Congratulations to our 2016 December Graduates!